On the offensive side, our priorities are to consolidate relationships with our loyal trading partners and to gain access to new, higher earning markets. The United States and European Union are examples of potential new markets. In the United States, where the federal government implements a number of complex domestic and import supply controls, the price for raw sugar is around US21c/lb or AU$720/tonne. This is considerably higher than the current global export price. 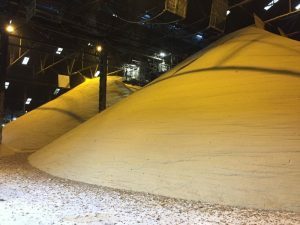 Currently supplying around 100,000 tonnes per year, or 3% of US total raw sugar import needs, Australia continues to look for new opportunities to increase our duty free access to the US market. ASMC continues to advocate and work with the Department of Foreign Affairs & Trade and Department of Agriculture and Water to achieve meaningful trade agreements that improve our competitiveness in current and new market countries. Upcoming opportunities include the review of the China-Australia FTA and the new EU-Australia FTA. Under WTO rules, Australia is allowed to export 9,925 tonnes to the EU at a prohibitive €98 per tonne duty. The EU’s total raw sugar import requirement is currently close to 1 million tonnes. The upcoming FTA negotiations presents an opportunity for Australia to improve the quantum of duty free access. On the defensive side, a significant concern is the increase in government intervention in sugar producing countries. Common government interventions include import quotas and tariffs, direct payments to growers, export subsidies and domestic cane and sugar price support. These interventions have multiple impacts, but they commonly incentivise excess production, global oversupply and depressed global prices. This means that the most efficient and low cost sugar producers like Australia lose money – compromising viability and new investment. Members of the World Trade Organisation enjoy certain entitlements but have also agreed to certain obligations. It is imperative that governments are fully transparent with the cost and type of assistance being provided and meet their obligations under the WTO. If inconsistencies are identified, effective dispute regimes are in place to hold countries to account. ASMC continues to advocate and work with like-minded global producers and the Department of Foreign Affairs and Trade, the Department of Agriculture and Water to advance global trade liberalisation in the global sugar industry.